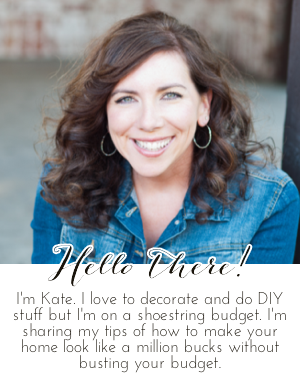 Chic on a Shoestring Decorating: Flaunt it Friday 110! I made it through day one of my garage sale this afternoon and am happy to report I made a lot of moola in just 3 hours! Yippee!! I will give you some tips on how to have a successful garage sale soon, like, when mine is over because I'm too tired to talk about it. Garage sales wear me out! It doesn't help that I was in the garage until 2am this morning setting up. Anyway, that's lesson one, don't procrastinate and end up in the garage until 2am like me. thanks for hosting! I don't think I could muster up the energy for a garage sale at this point. :) have a restful weekend! Glad your garage sale was a success! I had planned to have one this summer, but our garage is such a disaster right now, I can't even get the things out of it that need to be sold. I guess I'll wait until the weather cools down, organize the garage and try next summer! Thanks for hosting! I hope you'll drop in for my blog birthday celebration - I have 6 giveaways going on this week! Hosting a garage sale is always a big job and organization does pay off. Thanks too for hosting Flaunt it Friday - I added Vintage Eggcrates this week. Thank you so much for hosting, Kate! Thanks for hosting! I linked up my Peanut Butter Batter Dip! Check out all my healthy recipes, product reviews and giveaways @ bakingblissful.blogspot.com!